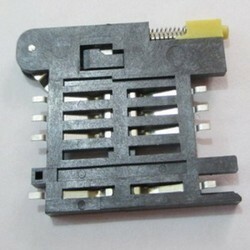 We offer SIM, micro-SIM, ChipSIM and MicroSD/SIM combo connectors for the mobile device market. 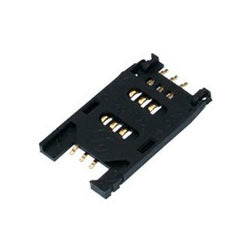 SIM card connectors offer 6 and 8 circuit versions to allow for memory expansion in hardware. Meanwhile, the micro-SIM card sockets feature push-pull, hinged and push-push styles to provide maximum design flexibility. These products are available as standard or custom products with many user-friendly features. We are listed at the apex for manufacturing and supplying of best quality Flip Type SIM Card Holder. Manufactured under the stringent supervision of experts and professionals, the whole range of SIM card folders offered by us is assured of utmost quality. The offered product is further highly regarded for its compact design. Committed to the satisfaction of our clients, we further ensure cost-effectiveness of the products we offer. Insulation Resistance 5000M ohms min. We are engaged in the business of manufacturing and supplying of best qualitySIM Card Holder. Provided with a hinge cover, it is widely acknowledged among the patrons we have. Known for its lightweight and perfect finish, the entire range of supreme quality SIM cardholders offered by us has amassed words of intense praise in the market. We are a highly acclaimed name that is involved in the manufacturing and supplying of best quality Flip type SIM Card Holder. The provided push and slide locking mechanism ensures high retention and operability. Manufactured in compliance with the predefined industry standards, the entire range of superlative quality SIM cardholders offered by us is highly regarded in the market.